The Thinpar64 from Venue Lighting Effects is a low profile DMX intelligent LED PAR Can that is designed with portability and convenience in mind. 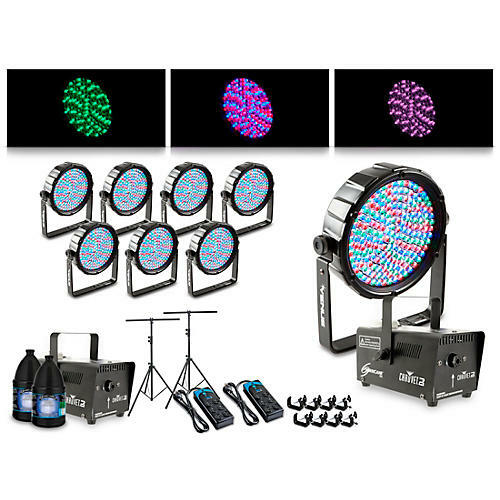 It is lightweight and super compact, which makes it a great lighting effect for use with Houses of Worship, mobile DJs, clubs and parties of all sizes. There are 100 bright RGB color LEDs that will provide plenty of lighting, and you can combine the red, green and blue LEDs to create a custom static color to set the mood. The Thinpar64 can be used as a stand-alone fixture in sound-activated mode, or controlled via DMX controller, which will gives you total commend over the action of the effect. The double-yoke hanging bracket allows the Thinpar64 to be easily installed by hanging on a truss or standing up by itself on the floor. There is also a power linking option so you can add up to an additional 60 units and fill-up any lighting rig.